New Jersey police have re-launched the “Cops in the Shops” program, partnering with local alcohol retailers to put undercover officers inside the stores and crack down on underage alcohol sales. The partnership’s goals are to charge adults who buy alcohol for those who are underage and crack down on anyone attempting to use a fake ID and/or purchase alcohol even though they are under 21. By re-launching the program during the summer, the police also hope to prevent a certain number of underage DWIs as well. Last summer, close to 230 arrests were made in association with the program. Possessing alcohol when you are under the legal age is typically a misdemeanor. In New Jersey, anyone under the legal age to purchase alcohol who knowingly possesses it without legal authority or knowingly consumes any alcoholic beverage in any public place (including schools and cars) is guilty of disorderly persons and fined $500. If the offense is committed in a car, the individual’s driver’s license is also suspended for six months. In fact, it is illegal for minors to even enter establishments licensed to sell alcohol for the purpose of purchasing alcohol or asking an adult to purchase it for them. This includes the minor misrepresenting their age in an effort to obtain alcohol as well. The law also prohibits anyone from purposely or knowingly offering, serving, or making alcohol available to someone under the legal age and/or making their properly available to the minor for this purpose. Anyone found doing so is charged as a disorderly person and has a criminal charge on their record, potentially facing a penalty of up to six months in jail and pay $1000 fine. 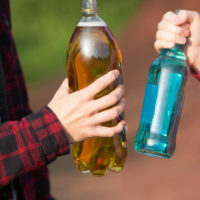 The only exception to the law applies to minors who consume alcohol with the permission of their parent or guardian on their property, as well as in conjunction with a religious rite or ceremony and/or during the course of employment in an establishment licensed to sell alcohol (such as a restaurant). If you have been charged with possessing or consuming alcohol under the legal age or making alcohol available to anyone who is underage, you need to speak with an experienced criminal defense attorney right away. We serve clients throughout New Jersey and New York; contact the office of Phillip J. Murphy to find out more information.